CHERRY COLA MARTINI - Nostalgia in a cocktail glass! Once upon a time, back in the "olden days" of my youth there used to be soda fountains in nearly every neighborhood. It might have been in the local dime or drug store or in an ice cream parlor, but somewhere within walking distance to most of us there was a place we could stop in and order a Cherry (or vanilla, lemon, chocolate, etc.) "coke". I'm not talking about some pre-mixed drek in a can here, I'm talking a real flavored soda where the cola syrup mixed with soda water right in front of you as it poured into your glass. You could ask for flavored colas and they would squirt in some flavored syrup before filling your glass with the soda. This was in the days before "Coke" when it was still the original "Coca-Cola" and you got some seriously great cola flavor with your fizz! Maybe in your region you had Pepsi or RC Cola, but you were getting that great, deep cola syrup and you could ask for more or less syrup depending on your preferences! My favorite of all the flavored colas was cherry. I have expressed before how much I love cherries and cherry flavored anything and my fountain drink was no exception. No lemon, vanilla or chocolate for me - give me CHERRY COLA! I've never liked the pre-mixed cherry flavored colas. They just aren't the same. I've tried mixing a good cherry syrup into cola but it didn't cut it. I was bereft of that real cherry cola experience until I got a bottle of Diplomatico Reserva Rum and thought to pour some into my canned cola. Surprise, surprise! Not only did it taste pretty darn close to those flavored fountain colas of my youth, it had booze in it. Don't be fooled by the simplicity of this cocktail - this has got the real nostalgia goods! It's a retro repast for Happy Hour! 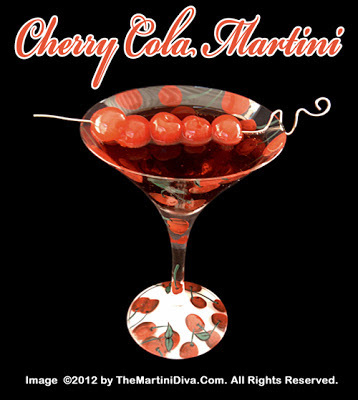 Into a chilled martini glass pour the Maraschino cherry juice, add the rum, pour in the cola, stir gently then garnish with your Drunken Cherries and enjoy. * Use my recipe for Homemade Maraschino Cherries but use rum instead of Luxardo Maraschino Liqueur or Bourbon.